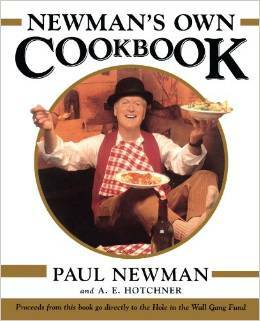 Once upon a time, I bought a (used) cookbook of Paul Newman recipes. A couple of them have become staples of our home. One is the non-nonsense hamburger. Another is this pork tenderloin recipe, which features Newman’s Own salad dressing. NOTE: marinate for at least an hour but we marinate overnight. This pork tenderloin recipe features Newman's Own salad dressing. NOTE: marinate for at least an hour; this time is not included in total pre/cooking time. Trim the pork tenderloin of any excess fat and silver skin. Mix the dark molasses and dressing in a self-sealing plastic bag. Add the pork and seal the bag, squeezing out as much air as possible. Marinate in the refrigerator at least one hour, turning occasionally. I usually marinate overnight. When ready to prepare the meal, remove pork from refrigerator to come to room temperature. Add the 2T of Newman's Own Olive Oil and Vinegar Dressing to a 2-quart saucepan and bring to medium heat. Add shallot, cook 2-3 minutes. Drain the berries from the port; add the port to the saucepan. Add chicken broth, berries, and ground red pepper. Bring to a boil, then reduce to simmer; cook until reduced by half again, approximately 15-20 minutes. Now that the sauce is reducing, preheat the grill. Remove the pork from the marinade and roll it in cracked peppercorns. Reserve the marinade for basting. Place pork on hot grill and sear on high heat. Reduce heat to medium; turn and baste with marinade every 5 minutes, for approximately 12-15 minutes (internal temp 145F). Remove from grill and let it rest for 3-5 minutes. While meat rests, thicken sauce by adding cornstarch mixture; bring to boil. Slice thinly and serve pork with sauce.